San Antonio hotels are renowned for their world class comfort and amenities, providing guests with top of the line service that leaves them wanting for nothing. Whether in town for business or for pleasure, these hotels make their guests feel like they are home, providing them with opportunities to relax and work as they please, without having to worry about their personal needs or concerns. Free parking a convenient location an outdoor pool and Wi-Fi are a handful of amenities our guests appreciate at the Best Western Plus Medical Center South. The Best Western Plus Medical Center South spans five floors and its 123 rooms include comfy bedding cable TV and coffeemakers. For those who want to put in some extra office time take advantage of the on-site business center. Anyone wanting to get in their daily workout head to the 24-hour fitness center. Guests who brought their own wheels to town will applaud the free parking and each morning they can fuel up with the hotel's free breakfast before hitting the road. The Best Western Plus Medical Center South is 11 miles from SeaWorld 12.5 miles from Lackland Air Force Base and 11 miles from Six Flags Fiesta Texas. Historic downtown San Antonio Alamo Plaza and the popular River Walk are 10 miles away and the hotel is eight miles from San Antonio International Airport. With a location close to several San Antonio attractions affordable amenities and an outdoor pool for those lazy hot San Antonio days and evenings our guests can't go wrong at the Best Western Plus Medical Center South. Free continental breakfast free Wi-Fi a pool and Six Flags just three miles away are a lucky seven of a deal for our guests at Econo Lodge Inn & Suites Fiesta Park which also offers free parking. The Econo Lodge has 62 value-priced rooms in a two-floor building with exterior corridors. Rooms come with premium cable TV free Wi-Fi and mini-fridges. Some rooms have microwaves. Lodge yourself at this Econo Lodge's free breakfast and enjoy waffles doughnuts cereals coffee tea and juice. The hotel also has an unheated outdoor pool and 24-hour front desk. Parking is free. The hotel is right off I-10 just three miles south of Six Flags Fiesta Texas home of the Goliath roller coaster and other thrills. If you're driving from San Antonio International Airport the hotel is 10 miles northwest. Shopaholics can get their fix at The Shops at La Cantera next to Six Flags. If the bright city lights beckon that's 14 miles south along I-10. When you get there check out the River Walk the Alamo and the Tower of the Americas. Our guests save their pennies for Six Flags fun with a stay at the Econo Lodge Inn & Suites Fiesta Park a low-priced winner with free breakfast a pool and easy access to the freeway. Our guests enjoy comfy accommodations complimentary amenities and a convenient location at Econo Lodge Inn & Suites Downtown Northeast. This two-story property features 47 rooms with available Wi-Fi. All accommodations include microwaves mini-fridges and coffeemakers; some have sofa beds. Rooms open to exterior corridors and non-smoking options are available. A complimentary breakfast is served daily and there is an outdoor pool. Pets are allowed for an additional fee. Lackland Air Force Base is an 18-minute drive from the hotel. The San Antonio Zoo is a seven-minute drive and the AT&T Center home of the Spurs is two miles away and Riverwalk with its shops and restaurants is three-and-a-half miles from the hotel. It's nine miles to San Antonio International Airport. The "convenient" location near I-35 and "large" rooms make Econo Lodge Inn & Suites Downtown Northeast "great for the price." Free Wi-Fi and breakfast in a downtown location up the value factor at the non-smoking Hyatt Place San Antonio/Riverwalk. This six-story hotel has 131 rooms with separate living and sleeping areas. Rooms feature beds with pillowtop mattresses 42-inch flat-panel TVs sofa beds private balconies mini-fridges and bathrooms with granite vanities. There's free Wi-Fi as well. Enjoy a free continental breakfast each morning or grab goodies from the bakery cafe. Burn off the calories with some cardio in the 24-hour fitness center or a few laps in the heated outdoor pool. Newspapers are free and there's an on-site business center. Parking is available for an extra charge. 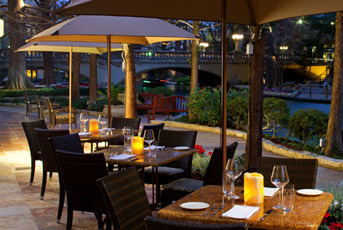 The Hyatt Place is three blocks from the Riverwalk San Antonio's famous three-mile stretch of shops and restaurants. You can come eye-to-tooth with wild animals at the San Antonio Zoo five miles away. Guests will remember the Alamo the historic site of Texas independence (less than a mile away). If you need to fly in or out the hotel is nine miles from San Antonio International Airport. our guests like the "great food" and "spacious rooms" at this Hyatt Place that's within easy walking distance of the Riverwalk and other downtown attractions. With affordable rates free parking Wi-Fi and free breakfast the Americas Best Value Inn - San Antonio Downtown puts our guests close to the attractions while helping them stay on budget. The whole two-floor 52-room property is outfitted with free Wi-Fi so whether you're relaxing in your room or soaking up some rays by the courtyard and sun deck you're connected. Some of the rooms have microwaves and refrigerators so be sure to request one in advance if you're in need. Pets are permitted(for a reasonable daily cleaning fee) and there's also free parking—a plus in downtown. The business center is stocked with a computer and copier and the fitness center has a treadmill stationary bike and free weights. A free deluxe continental breakfast is served daily. The hotel is located off I-35 and enjoys easy access to all major freeways including I-10 and Loop 410. The golf links at Brackenridge Park are a five-minute ride away and you can be at SeaWorld in 15 minutes and Six Flags Fiesta in under 20 minutes. Historic highlights and downtown attractions like River Walk the Alamo Tower of the Americas and the Convention Center are within two miles while San Antonio International Airport is over 10 miles away. Welcome perks easy freeway access and a close proximity to downtown make the Americas Best Value Inn - San Antonio Downtown a keeper for our guests headed to the area. Plush beds free Wi-Fi an indoor pool and a free three-mile airport shuttle impress our guests at Hilton Garden Inn San Antonio Airport which also offers free parking. The four-floor hotel has 117 modern rooms with mini-fridges microwaves desks free Wi-Fi and premium cable TV. Rooms have comfortable mattresses: Serta pillowtops in the double rooms and signature Garden Inn adjustable mattresses in the king rooms. Mattresses are dressed in cotton-rich sheets and crisp white duvets. Some rooms have jetted tubs. The weather will never stop you from getting a swim in because the heated pool is indoors. The hotel also has a fitness center 24-hour pantry lobby lounge and grill restaurant for breakfast and dinner. Parking is free. The Inn is a free three-mile shuttle from San Antonio International Airport. Experience the shopping dining and nightlife of the River Walk 14 miles south. Right near River Walk are the Alamo and Tower of the Americas. Attractions closer to the hotel are the North Star Mall (four miles south) the San Antonio Zoo (8.5 miles south) and Six Flags Fiesta Texas (11 miles west). Our guests appreciate the Hilton Garden Inn for its indoor pool cushy beds and free shuttle to the airport plus its easy location for sightseeing. Free Wi-Fi complimentary parking and a downtown location within walking distance of major attractions impress our guests at the non-smoking Courtyard by Marriott San Antonio Downtown/Market Square. This three-story hotel has 149 rooms where you can kick back on a thick mattress crisp cotton sheets and fluffy pillows and relax. Guests can sit back in an ergonomic chair at a spacious work desk and check their email thanks to complimentary Wi-Fi. Satisfy your early morning cravings with scrambled eggs sausage and more at the on-site bistro which is also open for dinner. Guests can work up a sweat in the well-equipped fitness center or just get some work done in the business center. Then splash into the heated outdoor pool and enjoy a refreshing dip. Parking is free. The Courtyard by Marriott is located a half-mile from I-10 and I-35 allowing easy access to the whole area. You can stroll through the historic Mexican-style market at Market Square a half-mile away too. The Riverwalk San Antonio's popular three-mile stretch of shops and restaurants is also a half-mile from the hotel. Guests can walk on the wild side at San Antonio Zoo five miles away. San Antonio International Airport is nine miles from the property. The "convenient location" and "great meals" earn praise from our guests at this Courtyard by Marriott that includes free parking near downtown San Antonio sights. Smack in downtown and offering free Wi-Fi an an outdoor pool the non-smoking Rodeway Inn Downtown near Riverwalk pleases our guests looking for a friendly and affordable place to stay near all the action. The two-floor hotel has 82 rooms along interior corridors and accommodations include flat-panel TVs free Wi-Fi coffeemakers ironing equipment and hairdryers. There's also plenty of free parking here (nearly unheard of in downtown) so it's easy to leave your wheels and walk to nearby attractions or hop on the tourist/city shuttle that stops right outside the hotel's front door. Along with a seasonal outdoor pool there are laundry facilities and ice and vending machines on-site. Parking is free. The hotel is four blocks from the Alamo and less than a 10-minute walk from Riverwalk. It shouldn't take more than 12 minutes or so to hoof it to Rivercenter the Henry B. Gonzalez Convention Center Tower of the Americas La Villita Park and elsewhere; if feet are weary there is a city shuttle stop nearby. The hotel is a little over eight miles from San Antonio International Airport. Rodeway Inn Downtown near Riverwalk puts guests in the heart of the action with a pool and free web surfing. The year-round pool I-10 location and free Wi-Fi are among the worthy features at Knights Inn San Antonio Near AT&T Center. The two-story Knights Inn welcomes guests with 120 rooms furnished with free Wi-Fi coffeemakers microwaves cable TV and desks and non-smoking rooms are available. Satisfy morning hunger at the free continental breakfast and take a refreshing swim in the year-round outdoor pool. The hotel also offers laundry facilities ice and vending machines and 24-hour front-desk service. On-site parking is free. Off I-10 Knights Inn lands guests within five miles of downtown San Antonio excitement. Once in the heart of town discover the Alamo or stroll along the famed River Walk. Within a two-mile drive guests can attend top concerts and Stars games at the AT&T Center. The San Antonio Zoo is eight miles away and it's 15 miles to San Antonio International Airport. our guests applaud the sweet prices and super handy location of Knights Inn San Antonio Near AT&T Center. With spacious suites free Wi-Fi free breakfast free parking and accessibility to so many attractions Residence Inn by Marriott San Antonio Airport is just the ticket for many Texas-bound our guests. With a good mix of 120 studio one-bedroom and two-bedroom suites on three floors this non-smoking hotel is a welcoming home-away-from-home. Trendy and contemporary but most importantly comfy suites include free Wi-Fi full kitchens with stovetops fridges and microwaves and high-quality beds with custom comforters and fluffy pillows; pullout sofas mean there's room for all. Services and amenities include free daily breakfast an on-site gym and an outdoor sports court. Take advantage of local restaurant delivery (or grocery delivery) after a swim in the pool or soak in the hot tub. Free airport shuttle is a nice plus too. The hotel is two miles from the terminals of San Antonio International Airport right along the 410 Loop a hopping hood with plenty of shopping and dining. Within 15 minutes you can be in downtown San Antonio discovering everything from the Alamo and River Walk to Market Square and HemisFair Park. Six Flags Fiesta is about 20 minutes away and SeaWorld is close to a 25-minute drive. Stylish space homey comforts free extras and concierge services make the Residence Inn by Marriott San Antonio Airport a pleasant home-away-from-home. An inviting outdoor pool and a downtown riverside location are some of the reasons our guests like the non-smoking Holiday Inn San Antonio Riverwalk. This non-smoking hotel has 23 floors 313 rooms and interior corridors. Guests rest easy on triple-sheeted mattresses in front of 37-inch flat-panel LCD TVs. You can flip open your laptop on a spacious work desk and surf the web with complimentary Wi-Fi. Accommodations include sofa beds wood furniture and CD/DVD players. The in-house restaurant serves steaks and Tex-Mex specialties and cocktails are offered in the lounge. You'll also find a state-of-the-art fitness center and a business center on the premises. Cool off with a splash in the sparkling outdoor pool then soak in the soothing hot tub. Valet and self-parking are available for a fee. Situated in downtown San Antonio the Holiday Inn is along the San Antonio Riverwalk a mega-collection of shops and restaurants. Guests remember the Alamo the historic site of the Texas Revolution a half-mile away. Take the kiddies for some interactive fun at the San Antonio Children's Museum also a half-mile. The hotel is nine miles from San Antonio International Airport. A "great" location right on the Riverwalk "comfortable" beds and a "helpful" staff keep our guests happy at the downtown Holiday Inn.